Lou and I keep having these conversations about our plans for Ty after he dies. So many details that no one in our shoes should ever have to think about because no kid should die from cancer. These conversations are necessary and horrific and very, very surreal. From the beginning we decided we would cremate his beautiful body instead of embalming, but good God, either option is utterly unthinkable - isn't it? I created that body. All of him is part of me. We know that we need to have Ty with us, always. We will keep him in our bedroom because we've never slept apart from him since the day he was born. The thought of his body going through more torment absolutely haunts me... it suffocates me... I sometimes wake up in the night imagining I am burning alive. Planning for the loss of your child is nothing short of pure hell. I still don't believe this is happening. When Lou asked if there is something I want to leave with him, I blurted out "I want to cut off my hand so he never has to feel me let go, that's what I want to leave with him!!" Look at my baby's hands. Yesterday they formed a heart. I need to have those fingers intertwined with mine for always. My birthday was as nice as could be under these circumstances. In fact, I indulged in a little too much wine over an amazing dinner, which is why I didn't get to post an update :) I smiled a lot yesterday! Lou made it very, very special for me by surprising me with all of my favorite things. Of course, my greatest gifts were smiles from Ty, a little bit of soft laughter coming from the couch when I sang some super silly songs, and watching Ty and Gavin hug and kiss goodnight. My Gavin. He is so adorable and happy through all of this. Last night after we went to bed he said, "I'm going to miss Ty." I was taken back, as you can imagine. "You're going to miss Ty?" I asked. Maybe he was actually listening those few times I tried to explain that Ty may have to leave us... Then he said, "Yeah, when he goes hospital." I wonder where that came from. How much of this he is really picking up on. Before signing off for the night, I want to thank you for all of the comments and stories I have received about making the most out of your time with your children. Especially the photos of your kids jumping in muddy puddles!! I am starting a collection. That is the best birthday present in the world. Here is an abridged version of one of my favorite notes. This is what it's all about. Today we lived for Super Ty!! Today was a rare treat in Tx, it rained!! It rained so much we actually had muddy puddles . So of course we had to jump in them. At first Hailey thought I was crazy and kept telling me no because she didn't want to get dirty. I felt like the worst mommy ever, I focus to much on her being clean and looking perfect!! Not anymore thanks to you! After she saw me having fun and getting dirty she decided to do it and we spent so much time splashing in the puddles and making muddy feet pictures!! Thank you for making me see what's important and for giving me a beautiful memory to cherish!! After the fun in the mud we enjoyed a nice warm bubble bath together lots of fun and smiles!! Again I thank you for that, it has been so long since we enjoyed bath time. We rush through life everyday but because of you we will be stopping to enjoy the simple things. 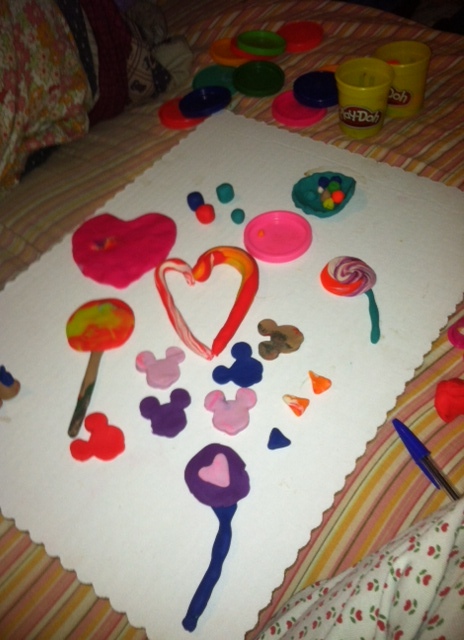 Then Hailey decided we needed to curl up in bed and play play doh and we needed to make candy for Ty. Hopefully we remembered all his favorites, we have candy canes and lolli pops, gum drops, skittles, chocolate kisses an candy corn. Hailey made the candy canes into a heart. We also made a big pink heart but as we were rolling it out a rainbow started to appear. Don't know how that happened but it was extra special!! Cindy, my heart aches for you and Lou! No parent should have to go through this. Praying for Ty always. God bless you! A part of Ty will always be with you, because you are his mommy! I could never have as much strength as you do! I'll be praying for you all again tonight! Kept refreshing my phone all night to see if you had posted. Ty is such a part of my daily routine. He reminds me what is impt in life. He smiles thru the pain. He loves his mommy and daddy and brother. He needs to live. The world needs Ty. He's only getting started. He's one of a kind. And he's the way he is cause of you and Lou. . Waiting up to hear from you. I am ever so glad that your two beautiful boys brought some special moments to your birthday. I do not know where you summon your strength from, as it is nothing short of a miracle. As always, thinking of you and your family with infinite prayers. My friend at work came over to my desk sobbing about Ty and what he's been through. I didn't want to read the stories because I knew I wouldn't be strong enough to read it. Reality is, this could happen to any one of our babies (including my own), but I couldn't stay away and had to see for myself. I prayed to my dad who is passed on the other side to help, to do something. I told him he had a crappy childhood with not so great parents, so give Ty the childhood he deserves because he has the parents that can give him everything and who already have given him everything! I don't know if he listened to me or God for that matter because I spoke to God too. Daddy here my prayers, please, Ty has been through so much pain, give him his quality of life back. I am so so so very sorry for what your beautiful baby boy has endured....and each of you as well to take this journey with him. My thoughts and prayers are with all of you. Cancer is horrific...babies getting cancer, there are just no words. I am a faithful Ronan lover and have been so since April 2010; I hope you don't mind that I continue to check in on your Super Ty. Sending so much love and wishing it would take an ounce of pain away...though I know that is impossible. I cannot believe this is happening to Ty, to your family, or to the army of us who love him! My prayers are with you always. I can see in Ty's face (and that great smile) that he is with God. I pray we can also keep him with us. Even more prayers and love to Super Ty. His hands will be forever entwined in yours. Love to all the Campbell family and God will see you through. Whenever I see a muddy puddle, I will see Ty. thank you for sharing this blog with the world. you are, like Maya Thompson, breaking down the facade the world has put up that childhood cancer is happy bald kids. I know sorry doesn't help or make anything better but nonetheless i am very sorry for what you and you and your family are going through. Love and prayers for you and BEAUTIFUL boys. Ty is just too perfect. What a lovely picture of him with his hands looking like a heart. And Gavin, what a big boy he has become indeed. Like everyone else I have definitely been inspired by you guys and vow to live every moment to the fullest with my son. I lost my mom when I was five, my dad was sick all my life and not able to raise me and my sister - so I always understood that life is short and to appreciate all you have - especially your health. But following you all on this journey has really open things up to a whole new level. I pray constantly for the miracle that makes Ty healthy and whole. Share his goodness with all who will listen. I am trying to understand why God would put Ty through this suffering, why he's putting you all through this. No answer makes sense or brings comfort - all I can say is that I am so sorry. So very sorry. Thank you for continuing to share beautiful Ty with us - I anxiously await every post. Bless Ty. Bless Gavin. Bless Lou. And bless you Cindy. Thank you for helping me want to be a better mother, wife and friend. SuperTy always and forever. I'm so sorry you are having to go through this. Ty is a beautiful little boy and i pray that by some miracle he will be healed. No parent should ever have to go through the death of their child. 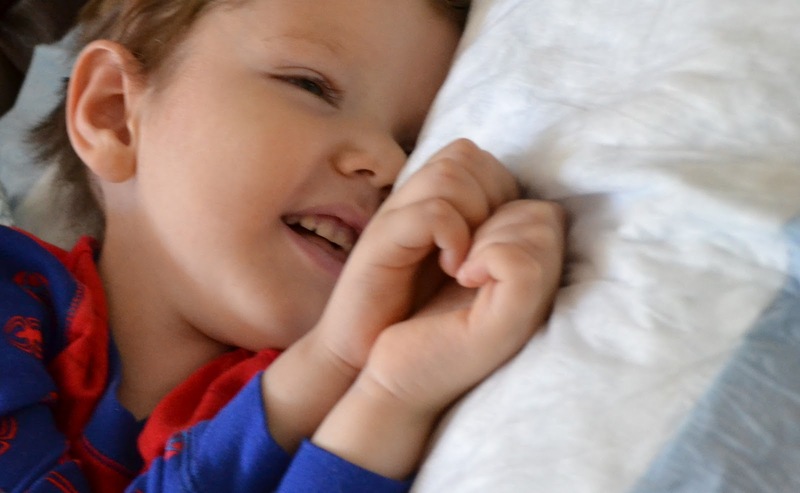 Ty continues to be such a gift to the world & Cindy, Lou & Gavin are such amazing gifts to Ty! My prayers for complete healing for Ty if it be God's will & peace for his family & friends. Much love is being sent your way. I eagerly await your posts every night, and pray to finally see a headline that refers to Ty suddenly jumping off that couch announcing "I feel bedda!" My longing for this is so intense, I shudder to think how overwhelmingly unbearable your longing must be as his mother. Whatever happens, Ty is with us know and we are all forever changed... No. BETTERED because of the sweet, beautiful soul in Ty. It will live on forever! I am praying for your family. I won't try to imagine your pain. My son is 23 months post BMT and an alumni of MSKCC's M9, we spent almost 6 months in-patient. I know I am a stranger but you are my sister and Ty could be my child. So tired of our kids suffering; so tired of being ignored. 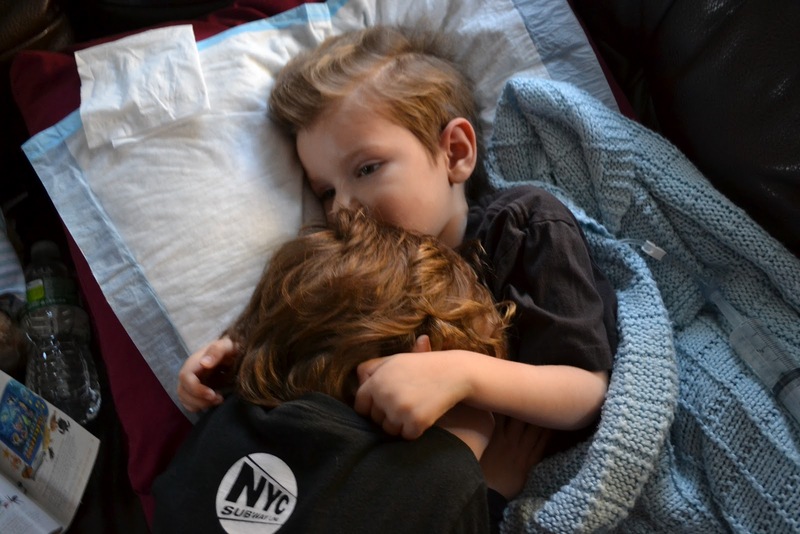 I hope the friends you''ve made via this blog realize they have an obligation to raise money and awareness so that no other child has to face the lack of answers and safe treatments for childhood cancer. I am a mahopac mom, if I can help if u need an ear I can offer at least that. Keep holding and kissing your babies, and smelling them. As long as u can. Though this blog, Cindy has made me realize how important raising money and awareness is. I pray every day for Ty and the Campbells and now I am dedicated to making childhood cancer a cause that doesn't go unnoticed. Sending a prayer your way tonight. I remember kissing my grandfather's cheek after he passed away, and realizing that his body was just his shell. I could feel his energy and his spirit around me, and it gave me a sense of peace and happiness, because I somehow knew, without a shadow of a doubt, that he was okay and he was happy. I am still praying non-stop for yet another miracle for Ty. I want more than anything for him to get up off that couch and live a long, healthy life. Please, please, know, though, that if he does go, he will forever be with you - and he will be okay. I just read Maya's post, and I wanted to let you know that as a mother of three boys I am also outraged by the lack of research and attention being given to childhood cancer. I feel for you, and will be thinking about you as your family moves forward in this unfair journey. Ty is a gorgeous, gorgeous child. WOW!!! Gavin's smile is EXACTLY like yours! I know Ty's is too, but in that picture - wow! As always, your posts shatter my heart, and make me smile, all at the same time. I admit I was anxious all day without any word on Ty, but I couldn't be happier for the reason behind it. I am so glad that you had a great birthday. What an amazing family you all are. I am praying for an equally great day tomorrow for Ty's big day. In the meantime, you're going to need those hands to keep up with Gavin! To cheer him on through all of his triumphs, to hold him close through life's ups and downs, and to fold in prayer, that one day soon, doctors will defeat this disgusting monster, cancer. Signs of Ty's unbelievably powerful spirit are everywhere... So many of us following your story, see him everywhere. Every morning, my 18 month old wants to go outside immediately. Of course, I always make him wait til the sun is up a little higher, til the fog burns off, til the dew dries up a little and the mosquitos settle down, til mommy's had her coffee, etc. This morning, with Ty in mind, I said - "ok, we'll go outside"... Well, wouldn't you know - on this cool, rainy, foggy morning, the moment we stepped outside, a big butterfly flew right toward us... it swirled around, and lighted on a flower in my garden. It let us walk up to it, and stayed there for my little guy to explore from just inches away, for at least a full minute. Then it again took flight, fluttering just above us for another minute, before taking off to rest on a tree branch above us. THESE are the gifts you have given all of us readers. You have given us these precious moments with our own babies. You're slowing us down, and giving us pause. Your words continue to amaze us readers. Ty's strength strengthens us. Lou's thoughtfulness warms our hearts, and Gavin's innocence and gorgeous smile, and fun nature gives us all reasons to smile and remember the pure beauty and joy that childhood is meant to be. We continue to pray for that miracle. God bless you all. beautifully written and again, exactly the things I've wanted to express but have such a hard time saying. This post captures what so many of us have learned from the Campbell family. Thank you for your eloquent words. Ty...you are a beautiful soul. I thank God for you every day and pray for a miracle. You took the words right out of my mouth. The Campbell family has been nothing but inspiring. God Bless Super Ty! OMG Cindy I just can't imagine what you have to go through every second of every day. I look at that gorgeous little face and its hard to believe he has the horrible disease in him. I am still praying for a miracle for all of you. If the miracle shouldn't come I am praying for YOU. I know at that point Ty will be okay but I pray over and over for you that you will be okay. No one should ever have to go through this. It is so unfair..
You guys are always in my thoughts and prayers. Hoping today is a great day for you. Remember each of these days that you guys are together you are created more and more memories. thank you for putting in to words what I've been struggling to convey. I agree with everything you said. You have made so many of us better moms. My sons are 4 & 6 so I feel our lives could be interchanged and what you're going through could happen to any of us. The other night at bedtime, after a long day at work, my youngest wanted one more piggyback ride and then just one more hug, then one more book and so on. I thought of you and said how you would love Ty to be asking for these things and I did them with him. He went to sleep a happier boy and I felt blessed. I have been doing the same with my children! I constantly ask myself why I really said, "No," to so many things. Thank you for helping us look at life differently!!! You have probably already thought of this, but maybe today's art project can be hand prints so you can always touch his fingers. I sit here every night checking and rechecking to see if you have posted. I fall asleep thinking about and praying for SuperTy. I am so happy to hear that your birthday was the best it could be considering what is going on in your life. Your ability to make me smile thru my tears will never cease to amaze me. It is no wonder that Ty has that same ability. My thoughts are so jumbled together, so much I would like to say but I can't seem to sort them out. My love and admiration for your family is unlimited. I agree with everybody who has said that Ty has made us all appreciate life and family so much more after reading his story. My prayers will never stop for precious Ty, for your entire family. I will never stop spreading his story, spreading awareness and doing all I can to help raise funds for research to find a cure for this horrible, devastating disease!!! A friend sent me this link and I was about to erase it - it's so much easier to keep my eyes and heart shut than to feel the pain of another, right? Well, thankfully I didn't do that - and shame on me for considering it. While your story absolutely broke my heart I am so inspired by the love and strength that you have, as well as the outpouring of love from so many wonderful people. I unfortunately don't have children, but I can tell you right now that I would not be handling your situation with the strength and grace that you are. I am also someone who rushes around, trying to do everything, and then once I slow down I'm quick to become "bored" - your blog and others' comments reminded me that love and simplicity are life's greatest gifts. The small but beautiful moments are the ones to hang on to. And I thank you so much for that .. and I feel sad and humbled that this lesson, for me, comes at your expense. I will continue to read your blog and pray for your beautiful son (and family) each and every day. God be with you - and know that we are all certainly with you as well! I am happy that you were able to have a happy birthday under these sad circumstances. That heart that Ty made is for you without a doubt!! What an incredible mommy he has. I can't even think of the possibility of you losing him. God just has to see what an amazing little boy he is!! Always thinking of him throughout the day. His smile is always on my mind. Cindy, my heart aches for you and Lou. I haven't ever posted because words seem insignificant to express how I feel--about a family I have never met! :-) Your story has had such an impact on me in so many ways. Your bravery and strength are amazing to me...SuperTy has a Super Mommy and Daddy! Your writing is beautiful, just like Ty. The other day I heard a song that made me think of all of you. It's called "I Need A Miracle" by Third Day. Know that like so many others, I am praying for God's healing for Ty, for comfort and strength for you all. Thank you for sharing your precious boy with us...what a gift to be blessed with. 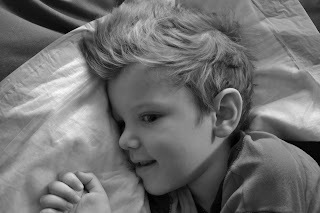 Having lost my Tyler on October 29, 2010, I do know how searing and frightening and surreal your life is. Tyler wanted to be cremated and have his remains scattered at the sleep away camp he attended for 10 years which we did. We kept some ashes as well. When he was undergoing radiation I knitted a blanket for him in camp colors (blue and gold). I actually knitted, took it apart and re-knitted the blanket (I'm not such a good knitter). That blanket was cremated with him. Sometimes I wish I still had the blanket to snuggle in but I like to think that it is with him and that he is wrapped in all my love, hopes and dreams and that he is safe and warm knowing how much he was loved. I read your posts with tears running down my face and smiles all at the same time! You are an amazing woman and mother who I admire for your strength, love, laughter, hope and acceptance with your journey with Ty. His smile, those beautiful toes, awesome hair I have fallen in love with. I think your decision to keep him with you always is perfect. He belongs with you always and that is exactly where he will always be. I am happy you had as nice of a birthday as you could under the circumstances and a little too much wine at dinner :) I wish you peace, ❤ and happiness always! I have no words only tears. The picture of Gavin hugging Ty broke my heart. No 3yo has to say bye to an almost 5yo. Today, I hate myself for being useless in your fight against cancer. I'm so sorry Ty that I cant make you better and find a cure. But I know when cure will be found it should be named in your honor. P.S. still refuse to give up on hope and will continue to pray. This has brought so many tears to my eyes. I buried my baby boy 5 weeks ago. He was born with a rare heart defect and he fought so hard for 16 months. Just like cancer, heart defects are something that children shouldnt have. Its just not fair. I feel your pain as I also watched my son die a little every day until his last breath. He was in my arms the whole time. It is the most difficult thing to do. To let your child go. It shouldnt be this way, no parent should ever have to bury their child. Through all of this i'm trying to let my faith carry me. I did not say good bye to my son. I told him to go nite nite and that i wold see him later. Because that is exactly what is going to happen. I plan to live my life the right way because i wanna be reunited with him in heaven when God calls me. Enjoy your time with your precious boy...God bless you and your family. I'm so sorry for your loss. How loving of you to reach out while your pain is still so fresh. I will never understand why any baby or child should have to suffer, in any way, let alone pass away too too soon. God Bless you and your baby boy. Is here in your perfect eyes, they're all I can see.” I am so sorry for what you’re going through and I wish there was something I could do. Love and prayers from Virginia…. Oh my gosh, my heart is broken for you. I just found your website off a blog I follow. Words can't even express how sorry I am for you and your family. Thank you for sharing your story and your beautiful words with everyone. Ty's story is sad. I have just started to follow your blog. I was introduced to it because I have been following Maya's blog for years. A close friend's grandson cruelly introduced me to the world of Childhood Cancer - not that there was ever a cruel bone in Alexander's tiny body. His parents, Tara and Jonathan Brown, are not bloggers. but their's and Alexander's story were compelling because I knew their parents personally. Your last post talks about what you both plan to do with Ty when he is gone (if they ever really leave completely). That is such a personal journey most parents can't even begin to imagine embarking upon. But I did want to share with you some of what Tara and Jonathan decided to do with Alexander. First and foremost because his form of brain cancer was so very rare (ETANTR) and agressive, they donated the tumor for further research. Even today, Alexander's cell line continues to fight the war he was brought into. His cell line is working in labs across the world to help discover new treatments for this agressive form of MB. Finally, they had Alexander cremated and they took a personal journey to a location that held special meaning to themselves and Alexander - Hawaii where they took Alexander on his Make-a-Wish journey to swim with sea turtles. There they retraced their steps and at all locations where Alexander enjoyed special memories with them, they spread a bit of his ashes until they had only a small bit left for themselves. Even now, after almost two years, when I recall this and tell it again, I can't keep from weeping. There is nothing comforting to say except to repeat what so many parents - too many - have shared. Keep mentioning his name whenever you talk about family things. Relish the sound of his name from others as they try to help you keep his memory close. And keep fighting for what you believe in as that is one of the few ways this war will be won. thank you for sharing Alexander's story. I am so sad for his passing, but so amazed that his family's donation is providing researchers such an important in tool in battling these cancers. What greater legacy could there be to Alexander than that through his death life for others will come. Tara and Jonathan sound pretty extraordinary themselves-to have the wisdom and courage to make that donation to science and to have taken Alexander's ashes and spread them around his favorite places. I hope that one day soon we will not have to read stories like this. I'm so sorry for the unimagineable suffering that Ty has had to endure. Thinking about your beautiful angel and your family. Still praying! Gavin looks a lot like Ty in that first picture. Good thoughts your way and tons of candy for Super Ty. I found your site thru Rockstar Ronan. My heart just breaks for you. I am thinking and praying for SuperTy and your entire family. This has to end... I'm not even a mother but I am OUTRAGED by this. The pain that these children go thru breaks my heart. As I pray for Ty and his comfort, I also pray for every child and family that has ever gone thru this. With awareness comes change... I heard of Maya and Ronan thru Taylor Swift and they have been in my mind and heart ever since. Sweet Ty and your family are now there as well. Cindy...I remember the innocent days when you were just a kid and you and your friends would come hang out with me and ask all about being all grown up! How I wish our lives could be that carefree again. Who would have known that growing up would bring us the most incredible joy with the birth of our children, and also the most searing, unimaginable pain. I want you to know that I feel every syllable of every word as if I am reliving those final days again in technicolor. You have been able to do eloquently articulate thoughts and feelings I was never able to put into words, and yet for most people, thankfully, they are still just words. They are words that will bring them to tears, for you and your family, but they will still never truly understand. I have felt and thought EVERY one of your words, and every thought, no matter how odd or strange they may seem to anyone else. In fact, Savannah, too, had a freckle on her toe, and I took so many pictures of her little feet...and I am so glad now that I did. Take video, my sweet friend...take as much as you can, every day. This will keep not only the still images of Ty, but those with personality, life, and will bring you comfort some day. I wish we had more. Sorry...I accidentally hit done, but I could go on and on. What I want you to know, Cindy and Lou, is that there are those of us who have taken our grief and anger, and have decided to take it straight to the top and tell them what we think of the underfunding of research and the lack of pediatric oncology drugs. I will be going to DC next week to an advocate training to learn how to advocate for these children's issues on Capitol Hill. I made my first trip over the summer to speak for our children and all children with cancer, and I joined the other moms and dads in this terrible club that we all belong to, most if whom had been there at least a dozen times. I will not stand idly by and allow our children to die in vain, and I am fighting so that there will be fewer moms and dads joining our disgusting club, that of those that have lost a child to cancer! Thought of this song for little Ty..
A friend's daughter has incredible medical needs and they set a site up for her. They've raised $5K in a day. How amazing would it be to launch this on Ty's birthday and set a goal of $1M? I find when people are able to track how much is being raised, it helps raise even more money. I would do it myself if I could. I know you are focused on Ty's care, but perhaps there's a friend or family member who could do this. I came here to say I read your email to Mya. And I now know about Ty. I will be praying for you and your brave, beautiful boy. He is gorgeous. Hello, I just began following your blog and please know that I am truly sorry for what you are facing at this time. I hope I dont offend you with what I am about to suggest; please know that I mean no disrespect. When I read your blog and I came to the part where you say you want him to keep your hand with him and I saw his beautiful hands forming a heart I thought of sonething. I just recently came accross a page on facebook that offers "casting" of hands, feet etc. for people such as yourself. Please let me know if you would like me to get you the information please feel free to call or text me at (915)433-4862. May God bless you. Maya's Rockstar Ronan page sent me here this morning. I have bookmarked you and I will be with you from now on, sending you (and Lou and Gavin and Ty) MUCH LOVE from Canada. My 5 year old grandson's name is Gavin. I found you through Maya's blog. I am so sorry and yet so angry. This should not be happening to your child or anyone's child. F**k cancer. My heart aches for you. I was introduced to your blog via a link on Maya Thompson's blog. I just want you to know that WE KNOW ABOUT TY and WE WILL BE SPREADING LOVE FOR HIM all around. There isn't anything a perfect stranger or anyone else for that matter could possibly say to you right now that would make any difference. I just want you to know that Ty is loved by so many. I was so brokenhearted to learn of Ronan Thompson. Unfortunately I didn't know of his story while he was still here, I learned of Maya and Ronan just recently. I know you will cherish every single second with Ty. He is beautiful, he is brave and he is an inspiration to everyone who learns of all he has been through. I have nothing original to say but want to say it just the same. I wish I understood why children have to die. There seems like there should be an answer for that, but there isn't. I am so sorry you are all going through this. Ty is a very sweet soul. His smile has touched my heart. I have been following your story for two years now and feel like an extended member of your family. My hand is in yours Cindy. You are not alone in your sorrow. Last night our family of 4 prayed for Ty at 7 pm. Watching my 3 year old close her eyes tight & pray that God could make Ty better brought even more tears to my eyes. I do believe in the power of prayer & you have taught so many so much, about grace, unselfishness, what truly matters and unconditional love. I wish you some peace in each day and many more opportunties to hold your litte angel's hands. Sending you love & strength. I am so sorry for what your family and that precious little boy are going through. My sister lost a beautiful baby boy, Eric, at 13 months old, to neuroblastoma. His fight was fairly short, only about 4 months from diagnosis to the end, and I don't honestly know how my sister managed to pick up and continue on after he died. But she did, for the sake of her two other children, and although it took quite a lot of time, she did eventually manage to find her joy and her smile again. She is an incredibly strong woman, and I'm so proud to call her my sister. She knows that Eric would not want his legacy to be unending sorrow in her life. She is a tireless supporter of pediatric cancer research fundraising, and Eric's picture and story is out there - he will not be forgotten. It's been 13 years since he passed away, and he's still in our hearts and minds, as Ty will always be in yours. With love and wishes for the strength you're going to need. Cindy, you are truly a selfless mother and an inspiration to all of us who are struggling through the day to day. I appreciate my child more because of you. Can you believe how much your little boy has done for other children just by you sharing his story? How many mothers are going to appreciate the time they have rather than rush through it? It's amazing! Ty is so amazing and so beautiful. Thank you for sharing your story with all of us. I have not been blessed by motherhood yet, pray that this comes soon, so I do not know of the pain you speak of. I can however pray, with all that I have for your sweet boy Ty. I promise to think of him...and share his story. I was introduced to your blog via Maya Thompson, www.rockstarronan.com. I am so happy to have been introduced, so I can learn more and spread the awareness. I am so sorry you and your family are going through this, but please find comfort in knowing that so many are praying for you. Hopefully this brings a smile in the midst of your pain. I have been reading your blog for a long time now. I have no words, I have nothing to ease your pain. I cry for you, I pray for you. I cannot even imagine. God bless you and your family and God bless that beautiful little boy. My mom decided to cremate my sister when she passed. She was 15 and she stays in an urn in my mother's room now; it really helps to keep them near you forever. Today I'm so sad all I have to say is....love. Praying with all my heart. Cindy you are such a talented writer that I always imagined that one day you and Ty would be sitting in a bookstore signing autographs of your book. That may not happen for Ty, but that doesn't mean that you and Gavin should not go in his place. When you wrote that you wanted to "cut off your hand" at first I read it as "cut off my hair." Afterwards I thought cutting off part of your hair and putting it in with Ty may not be such a bad idea. I pray everyday for your whole family. I wish I could do more to help. God bless you. I don't know what to say....my heart breaks for you. I have no idea how to contact you through email, so I thought this way you would be able to see. After reading Ty's story my heart cracked and then broke in 2. I can't believe that such a perfect little boy will be gone. I've always wanted a little brother and after seeing Ty's smiling, happy face, my heart just took him in as the brother I've never had. I know that sounds a little weird, but I get attached so easily and Ty just wormed his way into my heart. I will be praying for a miracle every day, that somehow God returns him to his original, bouncy, happy self, but I'm also praying that if he does leave us, that it will be peaceful and painlessly. If he's fought for so long, he at least deserves to leave us peacefully and painlessly. I'm praying for you and gorgeous Ty, and I hope that you know that. I also hope that Ty's laugh is the first thing I hear if I somehow get to Heaven. F*UCK you cancer, you've taken enough of the people I love, leave this little angel alone. It's all about love. Pain reflects love so it will be bad but it is love. Been there and it's bad. But it is love in the purest form. I send you both strenght and a hug. I have to say it now. I've known Caryn for about 15 years. She has known this 'awesome girl " named Cindy. I think for the past 15ears I've heard awesome things about Cindy. Thank you for showing me what life is all about Cndy. I stumbled onto your blog and now read it daily. While my heart aches for you and all that you are going through, I am in awe of your strength. I too have a 2 1/2 year old boy who had a brain tumor resected in Dec 2011. After a dark and difficult 7 months, he is now cancer free. But we realize that can all change in a moment's notice and we are terrified. I can so relate to your fears and feelings, but know that God does have you in the palm of his hands. Ty is truly an angel, here to touch lives and change people forever. Will keep Ty in our prayers. God Bless! Cindy, I have read your blog for months now. I am so sorry for the pain Ty, you, Lou and Gavin are going through. I hope you read this before you have to make a final decision, but I had a thought. What if you take pictures of your's and Ty's hands together and pictures of the whole family holding hands. These could be held by Ty. That way he has your hands with him forever. Take care and know that you have changed many lives for the better. i KNOW FROM EXPERIENCVE THAT YOUR IMAGINATION CAN'T BEGIN TO GET YOU TO THE PAIN THAT YOU WIULL FEEL. i WANT YOU TO KNOW THOUGHT THAT PAIN REFLECTS LOVE. sO WHEN YOU FEEL THAT SUCH INTENSE PAIN TO YOUR MARROW TOYOUR CELLS IT'S REALLY JUST LOVE THAT YOU ARE FEELING FOR tY AND THERE IS STRENGTH IN THAT LOVE. tHERE IS. hUGS AND i SORT OF KNOW. BASCILYY IT'S BAD BEYOND BELIEF ,BUT IT MAKES SENSE SINCE YOU LOVE HIM SO MUCH. PLUS IN THAT INTENSE EMOTION OF LOVE, THERE IS STRENGTH. yOU DO SURVIVE. BARELY BUT YOU DO! HUG TO YOU BOTH! I am a patient in the practice where Dr. Campbell practices. I just heard about this. I would like to see if myself and maybe one more person from my church can come and pray for Ty and your family. God works in the 24th hour; just what he does. If you would not mind emailing me tameremil@gmail.com and I will share more over email. Though I have never met Ty I feel that he has made an everlasting imprint on my heart. I hope that one day your blog will be turned into a book to remind everyone of what true love is and what life is all about. Praying for all four of you always. I type with tears streaming down. Each day, I have so many things to say, but can't get them into words. I'm so sad for you, but so inspired by you. And the mud puddles!!!!! I will never think of them the same way. 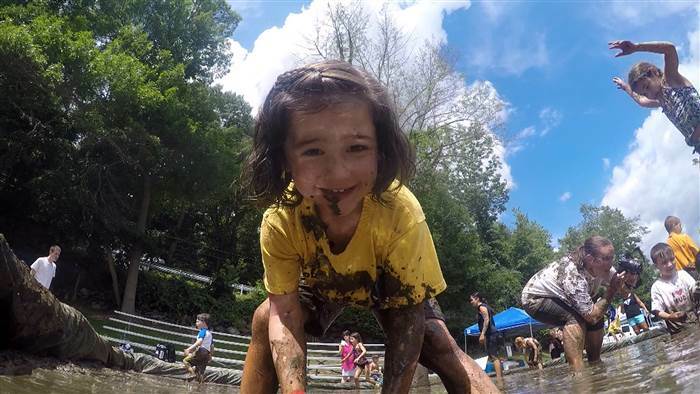 In fact, I think about how your next step in this march against childhood cancer should be titled "Muddy Puddles" -maybe you'll write a book or maybe start a business or plan a muddy fundraising event. I just know that you and Lou and Gavin will harness the powerful spirit of Ty and somehow change the world! It has already changed mine. Cindy, your story is an inspiration and thank you for sharing your boy with all of us. I pray for all of you. What about making a mold of your hands with his? I know it's not the same as his physical presence, it's just a thought. Praying all day every day. . .
What can anyone say to you that will make you feel better? Nothing at all. I'm sure that all the tears in the world won't do a damn thing, but I am crying my share for you anyway. You are a hell of a writer, I just hate that this is your outlet. No parent should have to go through what you have/are. Your words about buying a little suit for Ty are going to haunt me for a long, long time. I am going to pray hard that Super Ty wakes you up, the day after tomorrow, happy and completely cured. You have alot of friends you'll probably never know thinking, hoping, and praying for you and Ty, and your family. I'll pray for Ty's happiness and comfort, no matter what is to come. were to be married. I'm not telling you this for pity, but because I have been forced to accept death differently than normal people I guess? I pray for a miracle for Ty with every once of my being, but if that miracle doesn't come, I wanted to reassure you about the physical aspects. When the last breath is taken you will completely understand that what is left behind is a shell...a vehicle. I know from experience that you will still feel Ty all around you, embracing you. You will know that his beautiful little spirit will never leave you. You will feel him as the sun kisses your face and the breeze caresses your cheek. It's doesn't make the pain and sorrow go away, nothing does that...but it will bring you amazing calm and a sense of peace that I can't describe with words. I am so sorry Cindy. No one should have to live this nightmare that is your reality. I hope that my experience will help you but at the very least, make your nightmares about burning go away. My stomach turns when I read about your having to plan for Ty moving on. I look at my two boys and I can't imagine having to make those kinds of decisions. There's a feeling of helplessness which is so frustrating. There are so many of us who would do SOMETHING to help, if we just knew WHAT to do! Praying for a miracle, and for you all to find the strength to get you through this. But know that it's ok to fall apart, too. You're a wonderful mom. Happy early brithday to Ty! Happy Birthday Ty! May you smile and laugh with your family all day. May God always be by your side. You deserve all the beautiful things in life. Happy Birthday Ty! My heart aches for you and your precious family. What a brave strong boy you are. Looking at all of these posts and pictures only further exemplifies your beauty and angelic face. Mom, Dad, and Gavin are all part of that beauty. You'll shine within them always. Happy birthday, Ty. You're a hero. You're moms a hero, too. I pray for you, little man. Hang in there. Cindy, you're doing such a great job. I love reading your ever-so-human thoughts. You write so clearly and people are drawn To you. You have a gift. Having said that, I wish I could do something to help. I wish I could say something to make it better. It's just not okay. I hope you feel the love. You're not alone. I can only hope that I can live my life with the bravery, courage, and determination that Ty has shown. Ty is absolutely timeless, a soul so beautiful that it is incomprehensible just how magically perfect he truly is. He is a testament that angels truly are living amongst us. Happy birthday, Ty. What a beautiful boy you are. So strong, so sweet, so innocent. It's really not fair, this horrible thing that is happening to you & your family. There are so many that love you - it's hard to comprehend exactly why you had to be the one to suffer so. If love alone could cure - we'd have no illness. I pray for you every single day. When children blow bubbles - I think of you. Heaven is a beautiful place - it has all the balloons & bubbles from here on Earth. Cindy, Lou & Gavin - my heart aches for you. Know that there are many who love & support you, even though we've never met. My God give you grace, comfort & peace during this most trying time. I have never met Ty, but I think about him everyday. I think of him with only love and hope in my heart. Today is your birthday Ty, may God look down on you and grant you all the wishes and miracles a little boy can have! Your son is so beautiful...and cancer is horrible! My thoughts and prayers are with you. Oh my goodness he is such a strong and beautiful little boy. His sweet life is touching the hearts of so many people. My prayers go out for your family. Happy Belated Birthday. Im glad you had a nice time with your family. You are a strong woman and you are doing great. May God keep blessing you everyday. Happy Birthday to you Ty! I have chanced upon this blog about Ty from Rockstar Ronan. Ty is such an amazing strong, handsome little boy and I am praying hard for you and your family that he will be your miracle child and that God will answer your healing prayer. I can't control my tears of sadness and anger about why children get cancer...damn it and I will be praying damn hard now that a miracle for Ty and for your family is just around that corner. Ty is an amazing little boy. For that child to still have a smile on his face after every thing he has went through and continues to go through just shows what a special little boy you truly have. My prayers go out to the entire Campbell family! Have to go to sleep without him. This isn't fair for you for your family for ty. I'm so so sorry. I feel like I've focused on so many bad things instead of cherishing my daughters health. Thank you for your blog. There has to be a cure, I wish there was a cure found TODAY and Ty could be healed. Ty your so precious I wish I could give you life I'm sorry. Just found your blog completely by accident and like so many are sitting here with tears and pain thinking of you, Lou, Gavin and your family and friends. I will pray for Ty - your beautiful boy. My son has just turned 5 too and I cannot imagine what you are going through. My son - David - is also the love of my life. I live in Australia and my name is Margaret. I will continue to read your blog and I'm praying for a miracle - there is no distance in prayer. God Bless. I read about your beautiful family in the Poughkeepsie Journal and, like so many others, am praying for all of you. If you do lose Ty, you needn't worry about your sadness clouding the experiences you have with Gavin...I'm sure you'll discover an enormous love growing out of that sadness, a love inspired by Ty--by his strength and his courage--a love that will add color and joy to every moment you spend with Gavin. I'm praying every day for a miracle for your beautiful boy. God's blessings to all of you. It's Arlene, John and Catherine. Your friendly neighbors from around the corner in the highlands. We are not entirely moved in yet, but hopefully within the next few weeks...the closing is not far off. Our daughter ( who is 11 years old )brought it up to us that she would love to meet Gavin and perhaps have a game of tag or hide and seek, soccer, a catch and /or anything else Gavin would like to play anytime. She feels close to Gavin, thinks he is a beautiful boy and would love to maybe stop by and just play together. Catherine has no real family and also has an older sibling in heaven. Catherine is an "old soul" who achieves straight A's in school, loves to teach and adores reading. She does have quite the vocabulary to back that up :) Catherine feels the need to somehow help and thinks that playing with Gavin would be a nice change of pace and maybe even enviornment for him at HIS TIME OF NEED. Catherine has lost so many friends and especially both her Grandmas so very recently to cancer. Her Daddy had a three year battle with a rare form of cancer as well, and we are over the moon to be able to say that John, after his own battle at Sloan and at times following in his mom's footsteps during treatment there, is a cancer survivor today, thank God. So Catherine asked me to ask you if she could perhaps play with Gavin sometime soon, or later. Catherine is a joyful happy hearted girl who loves to laugh and I think might be therapudic to Gavin, not to mention the benifits that she would delight in knowing that life can be happy again and also in the feeling that the joy of laughter from his belly would bring. I hope that you understand that Catherine's intentions are that of wanting to nurture and play with Gavin as kids, and feeling that happy sence of freedom that children need, even when life is a bit too heavy. You have our info in the care package we left for you all on your doorstep last sunday. We hope to hear from you, but we also respect your own time of greif and will be right around the corner when you may want to have a visit or a fun game of soccer :). From your neighbors and friends, Arlene, John and Catherine.